Superior craftsmanship and top performance. 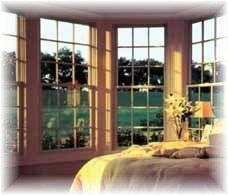 Andersen Windows 400 Series products feature the widest range of sizes, styles and accessories. Andersen Replacement Windows are a great way to add value and visual appeal to your Albany area home. Andersen Replacement Windows are functional with great design to give you the best of both worlds. We have provided you with a list of some of the benefits of Andersen Windows 400 Series Casement Windows. Casement and picture window combination. Andersen Replacement Windows feature rich natural wood interiors. Variety of hardware options in a wide range of finishes. Attractive low maintenance Perma-Shield� exteriors. Larger glass area lets in more light. Smooth Control� handle hardware opens easily. Andersen Replacement Windows come with either High-Performance� Low-E glass or high-Performance Sun� Low-E glass for optimum temperature control. Variety of grille & screen options. Andersen Windows come with a renowned limited warranty. Largest service network in the industry. If you are looking for Andersen replacement windows in the Albany area, please call us today at 518-432-9298or complete our online request form.